Some of my classic celebrity interviews are archived on my old Blogspot site, which I don't use anymore. I didn't have the site that long, so I didn't get a chance to load a lot of old stories on it like I had intended. But if you happen to be music fan of either The Beach Boys, Eric Burdon (and the Animals), The Monkees, Alice Cooper, Patti Smith and Alanis Morissette you may find it interesting how I handled interviewing these fabulous musicians. It's important to always be completely prepared when you are doing an interview with a celebrity, especially when your time is so limited. So, since you asked, I will now be adding many more of my older celebrity interviews and features here in this "In Retrospect" Section. As always I appreciate your support! Hope you enjoy. 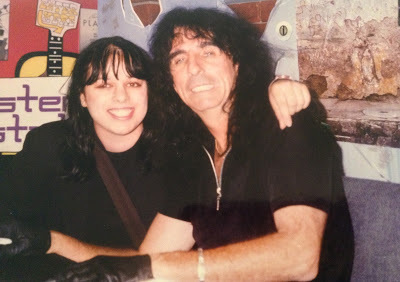 With Alice Cooper, still one of my all-time favorites! I got to co-write one of his late '80s concert tour programs. I was so happy! My good friend and former music print publisher Robert Barry Francos did this lovely little write up on me and some of the other fine FFanzeen contributors. I have fond memories of Robert. We would often hang out in the Village and distribute FFanzeen to various record stores, music shops, cafes, and small clubs like the famous Bottom Line and Bitter End. We always talked music—old and new artists. We liked a lot of the same people, especially The Ramones, Iggy Pop, New York Dolls, and Patti Smith. I was freelancing for a zillion entertainment publications at the time and always had a ton of interviews to place. I remember the first time I spoke to Robert. I was covering off-off Broadway shows for Variety, the famous show business publication. I called Robert and asked if he could use an Iggy Pop interview I had. Most of it was already promised to another publication as a cover story, but I saved a few quotes to use for a slant in FFanzeen because I really liked the look of the publication and wanted to be involved with it. Robert: When I first met Mary Anne Cassata, she was already writing for a number of other higher-end magazines, including a New York-based Music Paper, but she would rise way above that. Even when she was writing for me in 1984, she was interviewing some of the top artists of the time, including those who did not fit into the concept of my 'zine, such as Elton John, Cher, Boy George, Cyndi Lauper, Alice Cooper, and just about every hair band you can think of that was popular at the time, including Iron Maiden and Ratt. These were published worldwide in so many different glossies, that I know I could never keep track, such as Tiger Beat, Hit Parader, Variety, Hollywood Reporter, USA Today, Goldmine, American Songwriter, People Weekly, and even Rolling Stone. For FFanzeen, she used her magic touch to bring in interviews like the Animals (I went with her for that one), Mike Love of the Beach Boys, Spanky McFarlane of Spanky and Our Gang, Gary Glitter (went to that one, too), Patti Smith, and Iggy Pop (who had originally refused unless he was on the cover). After the hard print version of FFanzeenwas put to bed, Mary Anne has kept going, interviewing and writing, as well as being Editorial Director of Faces and Popstar! Publications for a number of teen-based magazines, and some special projects including whoever was big at the moment, and even one on Elvis. She is also known for the numerous of books she has written about artists of many genres, such as Michael J. Fox: The Year of the Fox (1986), Hey, Hey It's the Monkees (2002), The Cher Scrapbook(2002), The Essential Jim Carrey (2010), and The Elton John Scrapbook (2002). Other books she has authored include biographies of Britney Spears, 'NSync, Kirk Cameron and Alicia Silverstone. And her star still rises. For more on FFanzeen and some the artists covered from 1977 to 1988, go here.